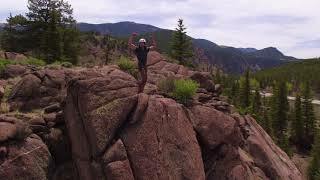 Find out what makes Colorado such an amazing rock climbing destination. Our friendly, knowledgeable guides will take you through the basics from belaying to rappelling and setting anchors. Our beginner routes are the perfect place to put your new skills to the test. For those who’ve climbed before, we’ll be happy to take your skills to the next level as you test out our intermediate routes. AVA is surrounded by vertical terrain in the Arkansas Valley, and we look forward to helping you explore it to the fullest. With half-day rock climbing lessons and guided climbing trips for beginner and intermediate climbers, we’re ready to help you test your limits and defy gravity. Our rock climbing tours meet at our scenic Buena Vista Outpost. Located just north of the town of Buena Vista, our outpost is convenient to whitewater rafting, zip lining, horseback riding, fly fishing, camping, hiking, hot springs, and more. Consider staying in one of our rustic miners’ cabins for a few days or reserving lodging in Buena Vista so you can experience everything that the area has to offer. Wanting to try a quintessential Colorado activity? Looking for some family excitement? 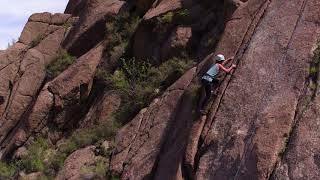 AVA’s rock climbing trips will test your focus, teamwork, and sense of adventure. 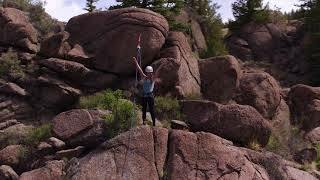 AVA provides family-friendly rock climbing that is sure to entertain children and adults alike. 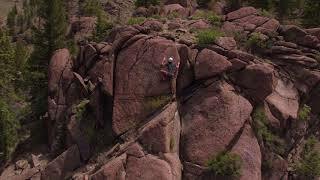 While younger kids will work out their energy scrambling up the rocks, adults and older children will appreciate some of the more technical aspects of climbing. Our climbing trips also make for great team-building excursions. Before you start to climb, your guides will go over detailed instruction as well as an in-depth safety orientation. By the time you start to climb, you’ll have a thorough understanding of what to expect. After checking in, your guides will determine which of our two convenient climbing locations will be the best fit for your group. Numerous climbing routes mean plenty of fun for first timers, beginners and intermediate climbers. All our climbs are “top rope” climbs. You’ll wear a harness attached to a rope that will catch you in case you lose your grip. When you are climbing, you’ll have someone keeping the rope taut for you. When you have finished your climb, you’ll maintain the rope, or “belay” for them. When you get to the top of your climbing route, it’s time to rappel down. 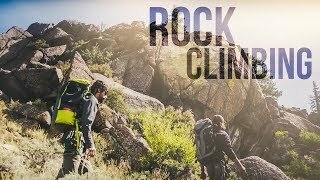 You’ll let go of the rock and use the support of your rope to gently descend back to the ground. Spend a day reaching for the skies. Spend half your day perfecting your belaying, rappelling, and climbing skills, and the other half whizzing through the trees on one of seven zip lines. We’ll provide lunch between the activities. Wanting even more variety? Pair a rock climbing tour with white water rafting options from family friendly to heart-pounding.